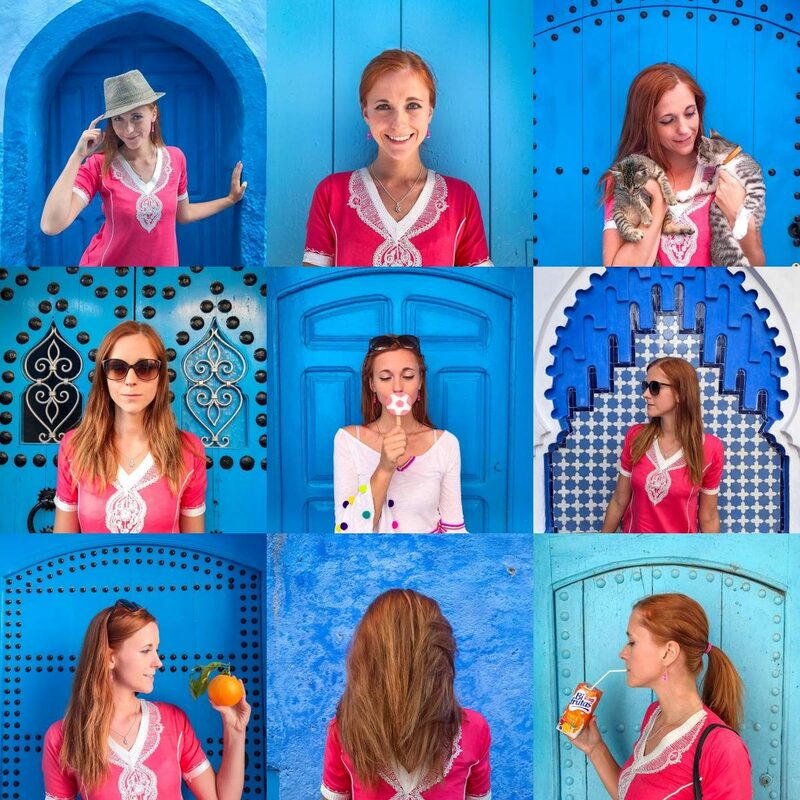 You’ve probably seen a lot of photos from a city with blue walls on Instagram. The town is Chefchaouen and it’s a truly beautiful town in Morocco, surrounded by majestic Rif mountains of the north. It’s a place full of history and many hidden finds. 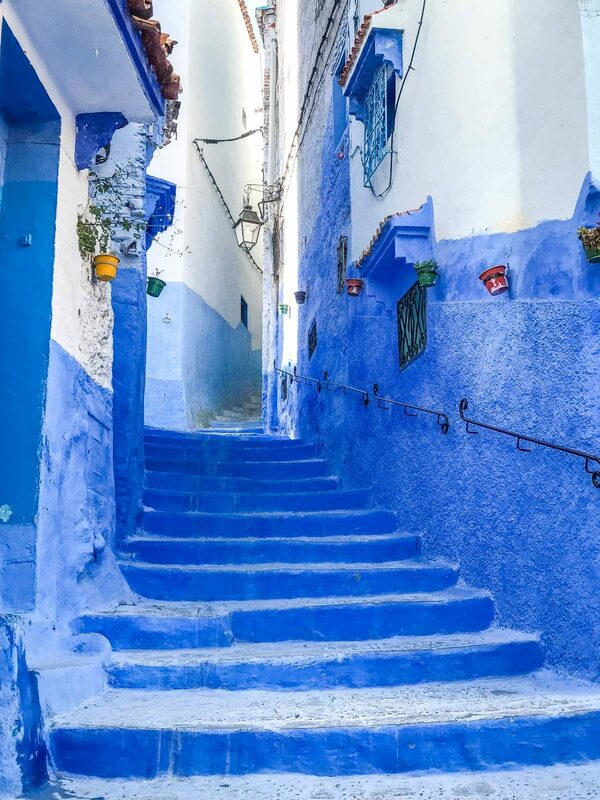 Chefchaouen can surely ‘blue’ you away! Chefchaouen is much quieter than any other Moroccan town I’ve visited. Instead of vendors inviting you to their shops, you’ll find quiet men waiting for you to ask them about a price. Streets are be filled with locals enjoying their days and echoing laughter from the children playing ball. 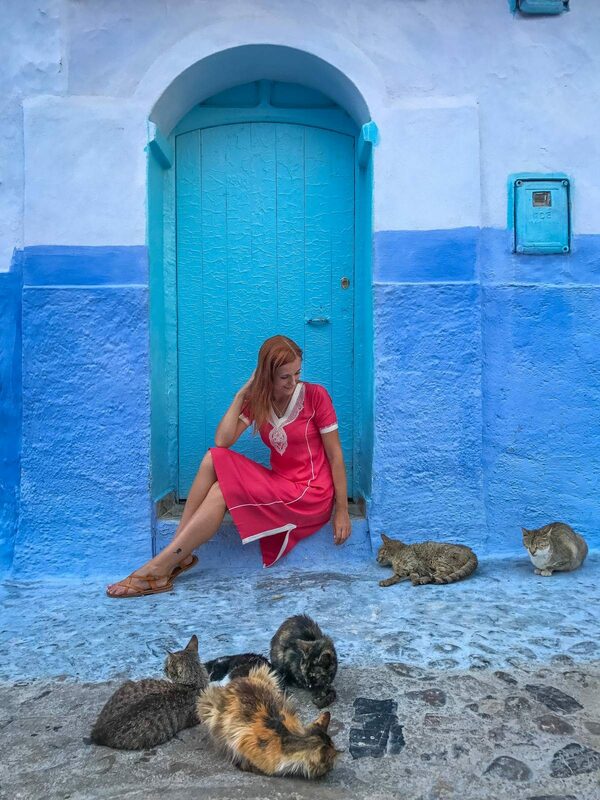 You can definitely try to get lost and observe local life and many kittens in Chefchaouen. 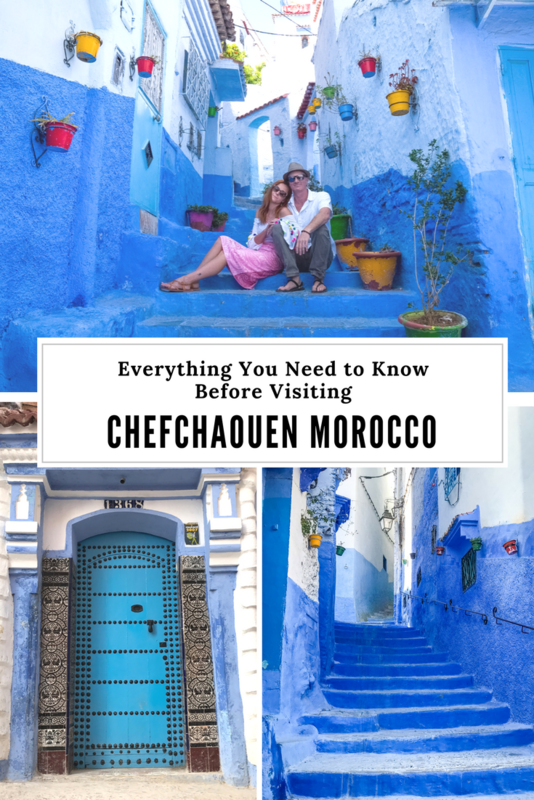 History of Chefchaouen – why is it blue? Noone really talks about why is the Medina blue. Chefchaouen was established in 1471 by Mulay Alí Ben Rachid. However, in 1492, during the Reconquista of Spain, Jews got expelled from Spain. Many of them fled to Morocco, establishing their own enclave in Chefchaouen. That’s why until these days the district Andalúz is one of the most popular of the Medina. 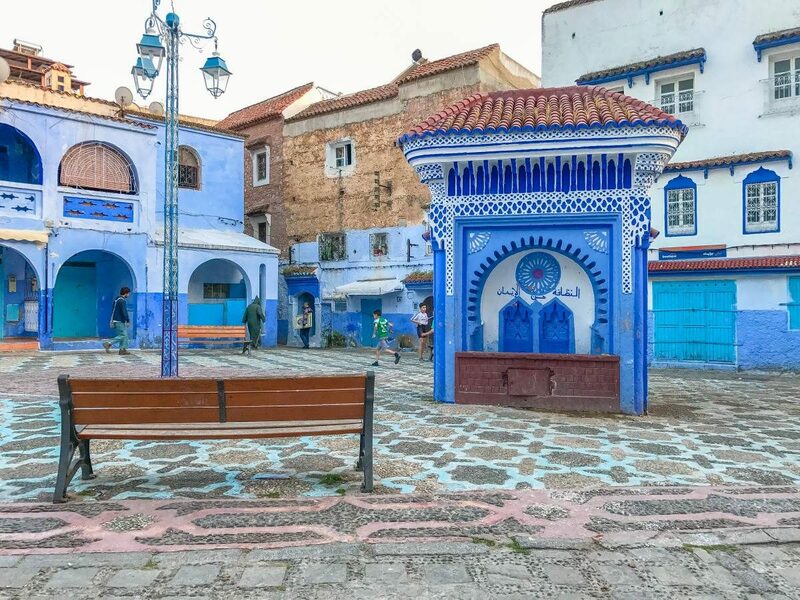 The Sephardi Jewish community that settled in Chefchaouen brought along their tradition of painting buildings blue. They believed the blue is the color of the sky and divinity, so it’ll remind them of the presence of God. The tradition is also actually present in other places, such as Safed in Israel. Some believe, however, that the color repels flies and mosquitos well, so it was a practical solution as well. The city was actually closed to all the foreigners, especially Christian under the threat of death, until the beginning of the Spanish occupation in 1920. The town had remained so closed off from the rest of the world that the visitors reportedly found its Jewish inhabitants were still speaking a 15th-century version of Spanish. 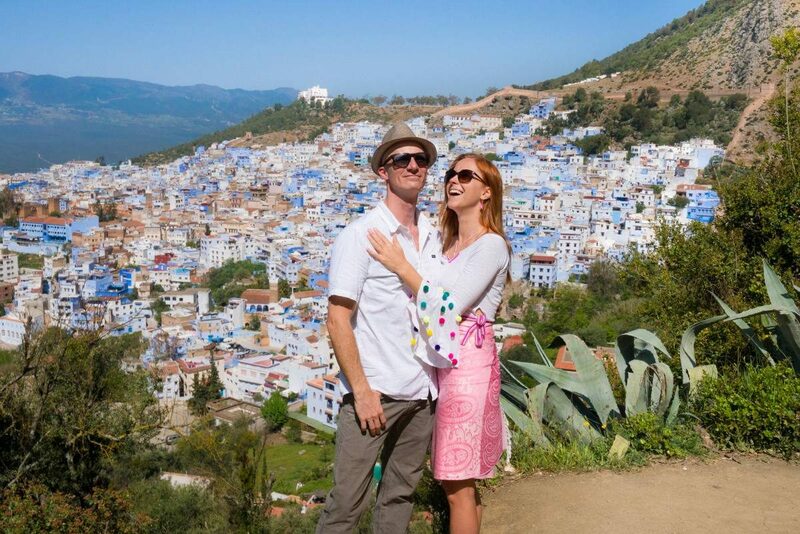 The easiest way to get to Chefchaouen from Marrakech is an overnight train to Tangier. You can get information on timetables and prices on the ONCF website and book tickets at the train station. There’s no need to book tickets in advance unless there’s a major holiday. A space in a four-bed couchette costs Dh370 ($38), a double compartment is /690 ($70), and a single compartment is Dh480 ($50). A space in a four-bed couchette costs Dh370 ($38), a double compartment is /690 ($70), and a single compartment is Dh480 ($50). The price includes a set of bed sheets and a bottle of water. The journey takes approx. 10 hours and it’s relatively safe. There are many women traveling solo, some with children, so if you’re a solo traveler you won’t be the only one. Once you arrive in Tangier, you can either take a taxi or if you’re on a budget, a bus. A taxi will get you to Chefchaouen quicker especially considering rare bus schedule, so if you’re short on time it might be worth it. If you’re flying into Morocco just to see the Blue Town, you have two choices: Tangier Airport or Fez Airport. Both airports are served with many international flights, including cheap airlines. I flew out of Fez after my visit and it was a quick and painless journey. You can take a bus or taxi from Tangier to Chefchaouen. From Fez a taxi will be pricey, so I’d advise a bus or a car. I traveled by public transportation the first time I visited Morocco, and rented a car for my second visit. Both options are easy and less scary than they seem. The shopping in this beautiful blue town is one of its biggest tourist attractions. But fear not, shopping in Chefchaouen is nothing like shopping in Fez or Marrakesh. 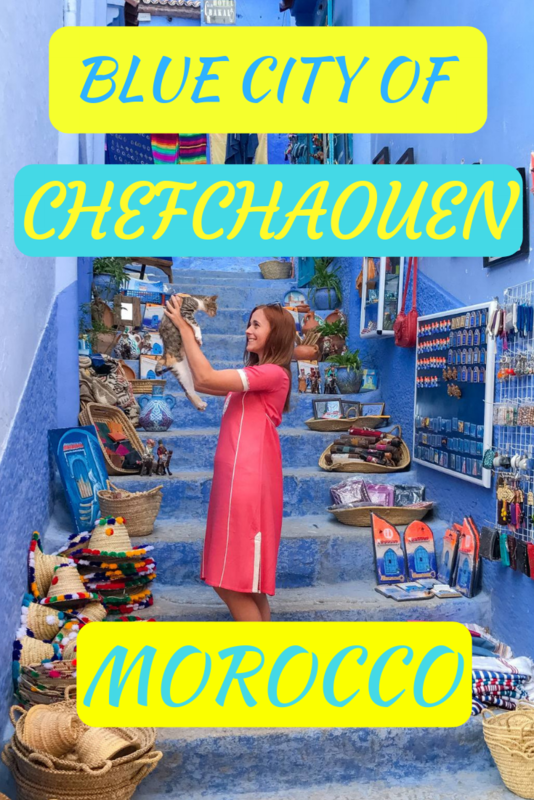 Unlike in other parts of Morocco, where vendors are trying to convince you to buy everything before you even enter the shop and haggle about everything, I actually had troubles buying anything in Chefchaouen. Quite often I found wandering around a shop without a vendor, as he left for lunch. Vendors will give you the correct low price straight away, and won’t push you to buy more. So if you’re thinking of buying some souvenirs, that’s the place to do it. I also enjoyed observing locals’ daily life around the Medina and playing with locals kittens. Located right in the middle of the main square, so you can’t miss it, is an Ethnographic Museum. It’s also called a Kasbah Museum (Kasbah = type of Medina or fortress). The museum holds a giant collection of regional artifacts including pottery, instruments, and paintings. Right next to the museum you’ll see a Mosque that dates it to the 15th century. It was built by the son of the town’s founder, Ali Ben Rachid. While only Muslims can enter, you can admire it from the outside. Morocco hides some nice waterfalls, and one of them is located nearby the blue town. Approximately 30 minutes by taxi from the kasbah, you’ll reach a beautiful trail leading to a waterfall d’Akchour. You can swim in it without hoards of other tourists. While in the area, also look out for the Bridge of God rock arch that’s spanning the river. A short hike up the hill from the Medina will take up to the Spanish Mosque, that’s overlooking the blue medina. It’s a decent hike, but nothing extreme so I was able to do it early midday and the sun didn’t kill me. Sunset views are spectacular from there too. One cannot spend some time in Chefchaouen and not get offered some weed and offered a tour to the hash field. The city is surrounded by green lush hash fields, so if you want to see something green on your trip, then schedule a visit. Morrocan is probably number one destination for door lovers. If you follow the hashtag #ihavethisthingwithdoors you’ll understand what I’m talking about. The blue doors of Chefchaouen, however, are a separate chapter. I don’t remember the last place I took so many photos of doors. While there are many Instagrammable places in Chefchaouen, remember that people actually live there and be respectful especially on smaller streets. If you see some locals coming in and out of your house, or children playing, give them some space. Bring cash. I haven’t spotted any ATMs inside the medina, and restaurants and shops are cash only with a few exceptions. When it comes to accommodation in Morocco I’ll always recommend riads (guesthouses) over hotels. A lot of them are over thousand years old, so they come with beautiful decor, history, and friendly talkative owners. 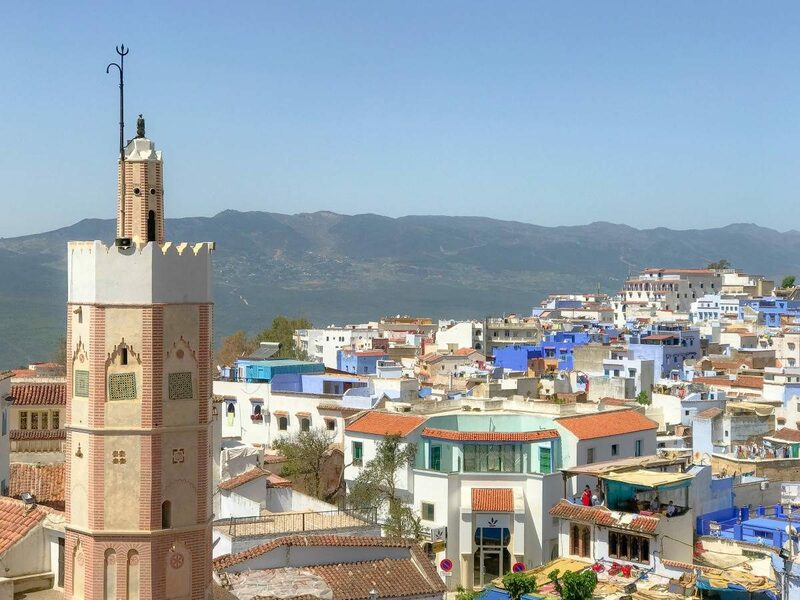 There’s no bad place to stay in Chefchaouen really, as long as you don’t expect a 5* resort – there are no such things there. You have two option: inside of right outside the medina. The town is relatively small, so there’s no problem getting around, but keep in mind that if you decide to stay inside the medina you’ll have to carry your own luggage to the guesthouse, most likely up some stairs. 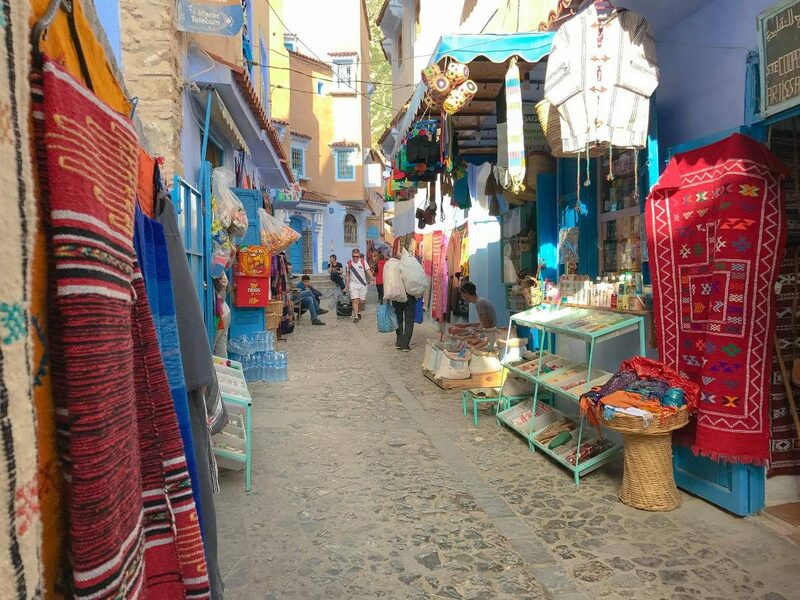 Chefchaouen isn’t Marrakesh, you won’t find anyone offering to carry your bags for a few Dirhams. I’d still recommend staying inside the medina, as the rooftops are awesome in the evening. I recommend Riad Assilah Chaouen, as it’s a stunning place with excellent hosts. Make a reservation slightly in advance, as it gets booked up. >> Read more on carry-on packing. 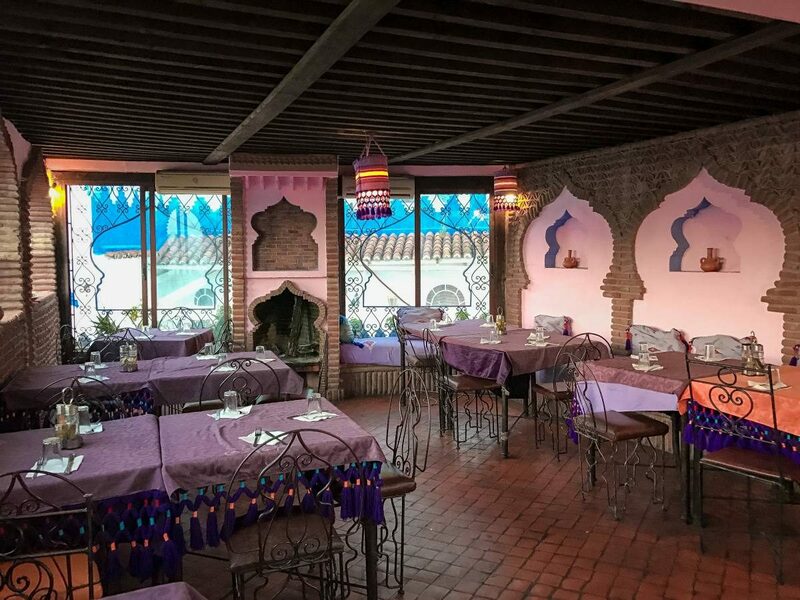 Alladin Restaurant – I stopped by the Alladin by accident and I’m glad I did. The interiors are incredibly decorated and the food surely delicious. 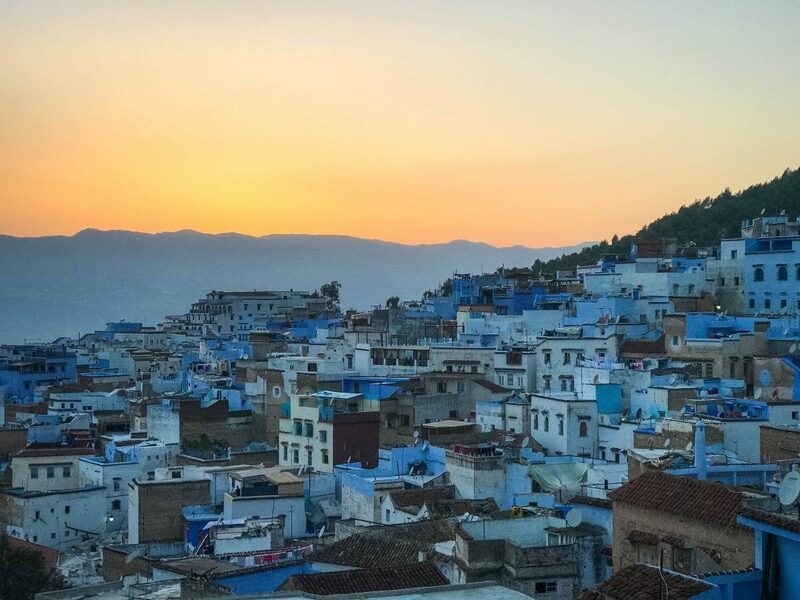 It’s the best spot to watch the sunset from one of their terraces while sipping on a Moroccan tea. Don’t forget to arrange a health insurance before heading to Morocco. The easiest and the most reliable travel insurance is World Nomads Travel Insurance. Get it before your trip to skip unnecessary troubles that might ruin your holidays!